Saturday on The Local Take On WCLK I spoke with Mary Wilson from Community Health Interfaith Partnership about Mental Health First Aid, a certification course that provides participants with tools to assist a person developing a mental health problem or experiencing a crisis. Ms. Wilson explains that the course began in Australia and has research to back up the results. Participants are presented with a certification after an 8 hour class. She goes on to explain that this course is for any citizen who engages with the public from teachers to first responders. Additionally she mentions churches, community members, everyone who engages with their neighbors, colleagues or associates. From the opioid crises to the rise in suicides more attention is being given to mental health challenges. 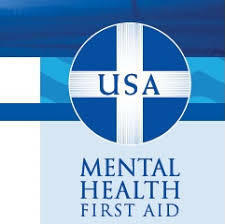 The CDC shares that more than 50% will be diagnosed with a mental illness or disorder at some point in their lifetime. 1 in 5 Americans will experience a mental illness in a given year. Kiplyn Primus talks with Mary Wilson from Community Health Interfaith Partnership on The Local Take on WCLK.